December 23rd, Alarm clock Prank! Good morning boys and girls…. Santa is a little groggy today. Yes, it seems Harvey was up to his shenanigans again last night, HO! HO! 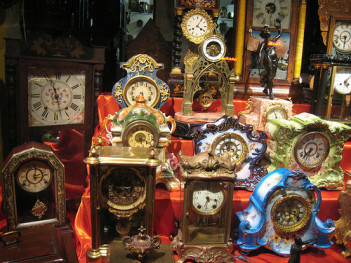 Do you remember me talking about all the clocks Harvey was making? Well, it seems he made about 15 of them and set the alarms for 1am – 1:10am – 1:25am – 1:40am – 1:55am – you get the idea! Every 15 minutes an alarm clock would go off in my bedroom! He hid the clocks all around and every time I’d wake up and turn one off, 15 minutes later ANOTHER would go off!! It was quite the night for sure!!! So you see, that is why I’m a little sleepy and groggy this morning. That Harvey is a Rascal!! But, he did feed the new baby Reindeer during the early morning hours while I was shutting off alarms!! And he worked all thru the night ‘Armin the GARMIN’ so that we will have the current addresses of all the good girls and boys of the world. ‘ol Harv may have been a little ornery with that little prank, but he’s working extra hard to make up for it!! I’m not suggesting you boys and girls pull anything like that at all – in fact I am DIScouraging it… but if you do make a mistake please try to make up for it by doing SEVERAL good deeds. It might be sharing with your little brother or sister, helping mom and dad around the house, cleaning up your room, obeying your teacher in school, or any other nice things you can think of. The Big Day is getting closer too!!!! We are just buzzing around the North Pole 20 hours a day, which is why I didn’t really miss too much sleep last night anyway! HO! HO! HO! Percy has made us extra helpings of Treats so that we have all the energy we need to work as long as we do preparing for Christmas Eve. I hope all you boys and girls have your letters and emails in to Santa. There’s still time, send an email to Santa@SantaAndHarvey.com and we’ll get a response back to you lickity split!! Well, I”m out of time right now….. time to get back to work. We’ve got more toys to pack, the Reindeer team to feed – and get their harnesses and bells shined up, we have meetings with the Elves on the Shelf, of course the Naughty and Nice list to check and recheck, so many things to do before we take off around the Big Wide World to see you all. So be GOOD, and help someone else who is not as fortunate as you….. because there’s only TWO more days and ONE more night before Santa and Harvey and the toys – we’ll all leave. Delivering Joy on Christmas Eve! Zooming and circling the globe we shall go, for a very MERRY Christmas!! HO! HO! HO! HO! HO! Bye bye boys and girls!! BYE BYE!! HO! HO! HO! HO! HO! Good Morning everyone!!! Mrs. Claus, Harvey and I just finished a big breakfast of Apple Cinnamon waffles with caramel syrup ,whipped cream and chocolate sprinkles!!! 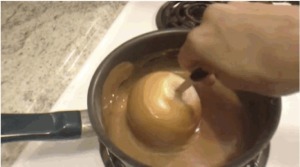 Percy did a great job… it was delicious!! Well,it was a long couple of days for ‘ol Santa and Harvey. 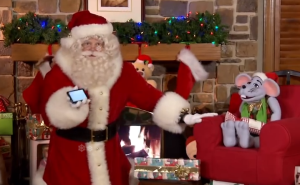 We made several trips to North America to check up on you all….. You know boys and girls, we talk about you all so much – and how you’re doing good deeds and helping others during this time of year… I thought maybe I’d show you a few of the children Santa has been lucky enough to see this year. This is TJ. We saw him when we visited Oklahoma in the United Sates a few days ago. He wants a Mickey Mouse guitar, a Robot and a wheelbarrow. 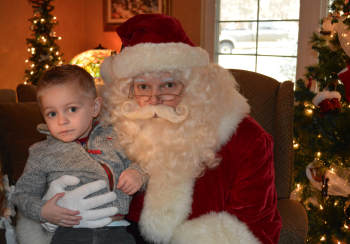 This is Cale and he was Santa’s BIG Helper during a recent visit to see some families in North America. He wanted a World Series Championship for his favorite baseball team – the Kansas City Royals!!! HO! HO! HO! This is Harvey and ‘Rusty’ the dog. Rusty has been a VERY Good dog this year!! He kept all the squirrels, raccoons, coyotes, armadillos and pests away from Greg and Beth’s big farm house in Kansas – and his obedience skills are ….. Well, he’s still trying as hard as he can!! HO! HO! HO! HO! HO! Harvey has been visiting children in Kansas, Iowa and Nebraska this Christmas Season. We can cover more ground when we split up to see you children. The Elves on the Shelf have just left to go back to their children’s homes after reporting to us here at the North Pole. Good news from most all of them too!!!! … there is one little boy in Oakville who had a little trouble staying on the nice list, but I’m sure his Elf ‘Boregaurd’ has him back on the good path today. HO! HO! HO! HO! HO! Don’t worry, those things happen but Santa understands if you have the true Christmas Spirit in your heart!!! I’d better go check on Harvey again… I hear a lot of clocks ticking in his work cubicle. Hmmmmmm what IS he up to?!! Till next time, there are only 3 more days and 2 more nights till Santa and Harvey and the toys – we’ll all leave. Delivering Joy on Christmas Eve!! Zooming and Circling the globe we will go, for a very Merry Christmas! HO! HO! HO! HO! HO! Bye, bye …… BYE BYE!!!!! We received a bunch of nice pictures from good boys and girls yesterday during our visits to Oklahoma… Here are two. One from Julian and one from his brother Vidar! Beautiful!! 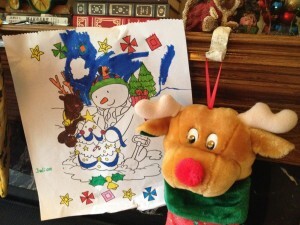 Thank you both so much, we have them by the fireplace here at the North Pole Toyshoppe. 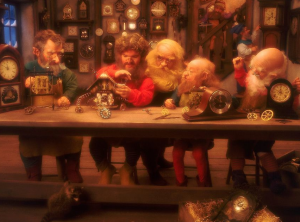 I’d better get back to the assembly area – Harvey is making a LOT of clocks for some reason…. I think he’s up to something – the little Rascal! HO! HO! 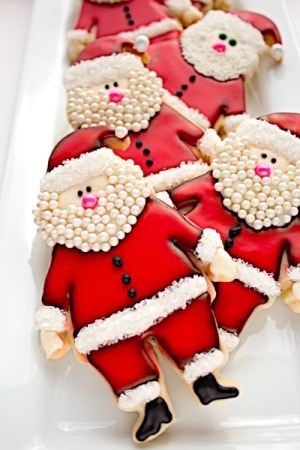 Keep being good and don’t forget the cookies and milk for ‘ol Santa!!!!! Till tomorrow, bye bye!! BYE BYE!!!! December 20th, 5 Days till Christmas!! Well boys and girls, the CLOCKS are ticking!! and its a whirlwind of activity here at the North Pole today!! Keep your letters coming! 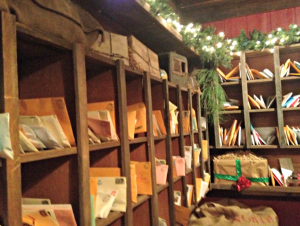 We won’t forget anyone that sends Santa a letter so mail them in to Santa@SantaAndHarvey.com and we’ll get a response out to you as fast as we can!! Harvey was up to his old pranks again last night during Reindeer flight practice. He taped a harmonica to the front of the Sleigh and when we were practicing our take offs and landings we heard this beautiful sound – but could not for the life of us figure out where it was coming from! HO! HO! HO! HO! Finally on the last landing of the night Harvey showed me what was causing the music and we all had a good laugh over that one!!! We’re going to have another new book up on the website very soon so stay tuned for that too. December 16th, www = World Wide Weather! Hello boys and girls! Harvey and I were just working on the coordinates for the big trip on Christmas Eve. 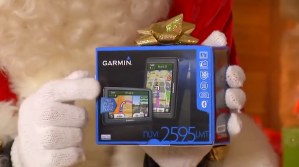 Techno Elves ‘Joey’ and ‘Ricky’ have been helping us make some tweaks and updates on our GARMIN GPS …. or as we call it ‘Armin’ the Garmin’!! HO! HO! Then we were talking about the weather forecast for Christmas Eve and how it is so different all over the big wide world. The weather has been pretty consistent here at the North Pole – Snow during the night and cold… 30 below zero right now and its still snowing! We’ve been getting a lot of questions from you boys and girls about the weather – and if we must have snow for the Sleigh and Reindeer to land! Well, don’t worry – we have all kinds of weather that we travel to during the big trip on Christmas Eve… and we have ways to land in any situation or weather condition. We land in fields and pastures, rooftops, sandy deserts, mountain tops, dirt, rainstorms, mud, ice and snow!! HO! HO! You see the runners on our Sleigh are coated with a special layer of magic dust and then covered with a coat of special varnish that allows us to smoothly and quietly glide in for a landing on ANY type of surface. That is ‘How we Glide’ here at the North Pole HO! HO! HO! HO! And did you know that the Reindeer’s hair is hollow? Yes, that makes them extra light for flying – and it helps to insulate and keep them warm too. Harvey and I rely on our warm and heavy Arctic Red Coats to keep us nice and comfy on the trip. But I was just wondering what the weather has been like in your hometowns? We always check the Weather Channel to keep us up-to-date on the latest weather and forecasts before we leave…. and the GARMIN helps us see what we’re flying into during the trip. Send us an email and let us know what kind of weather you’re having so we can add that into our calculations and make the trip more efficient! We need all the efficiency we can get too! Delivering toys to the millions and millions and millions of good boys and girls all over the big wide world is no small task! Bye Bye!!! only NINE more days till Christmas!!! We can hardly wait!! Hello again boys and girls! We had a long weekend and just got back to the North Pole Toyshoppe a few minutes ago. I took the newly painted and refurbished Christmas Eve Sleigh on a trip to North America Saturday to see some special boys and girls. We found them at shopping malls, Holiday parties, parades and at family reunions. We were in Utah, California, Nevada, Idaho, North Dakota, Nebraska, Kansas, Oklahoma, Texas, Kentucky, Pennsylvania, New York, South Carolina, and Florida!! To make sure our timing for the Big Night is just right we had to practice the best possible route to make all of our special deliveries in just one night! We also have to make sure all your addresses are properly loaded into our Garmin GPS so we don’t miss anyone when delivering all these toys we have piling up in the Toyshoppe. But if you’re changing plans on where you’ll be spending Christmas, don’t worry. Santa and all his fancy electronic locating devices will find you wherever you are in the Big Wide World! HO! HO! After all these years, we’ve got it figured out…. One of the most popular questions of the day yesterday was “Where did you park your Sleigh?” Well, we almost always find a small airport with lots of lights, so we can see it from high above. Then because there is so much flat area we can land easily and then have a special Santa ‘Taxi’ waiting for us. 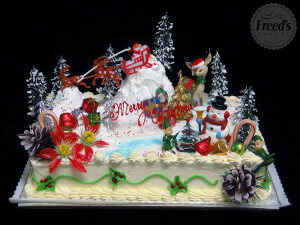 They then drive us to our locations and back – then its into the Sleigh and off we go ZOOMING back to the North Pole!! We’re getting close to single digit numbers till Christmas!!! Only 11 more days and 10 more nights!!!! OH, I just heard the ‘Treat of the Day’ alarm go off!! Percy promised some Santa cookies and milk today. So till next time, Merry Christmas to All and stay on the ‘Nice’ list!!! Good morning boys and girls! 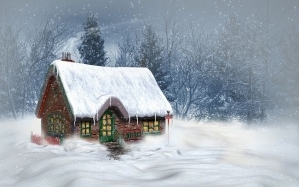 Mrs. Claus and myself, Harvey and all the Elves awoke this morning to the most beautiful new blanket of freshly fallen snow…..
Its always fun to tromp out and see your footprints and nobody else! It seems that Harvey has been taking ‘baking lessons’ from Percival – our Head Baker. You know how Harvey loooooooves to eat! Well, yesterday Percy was showing Harvey how to make his world famous Caramel Apples, but since Percy didn’t have enough to practice with, Harvey decided to use a white ONION instead! JUST to Practice with, he said…..
Well, somehow that ‘practice Caramel Onion’ found its way onto Santa’s tray of Treats yesterday, and when I took a bite expecting the sweet taste of Percy’s caramel Apple … well you should have seen the look on my face when I bit into that onion!!! HO! HO! HO! HO! HO! Needless to say, I knew who was at the bottom of the prank!! ol Harvey. But we all had a good laugh over it and Harvey has promised not to do anymore ‘practicing’ unless Percy or I are supervising. HO! HO! 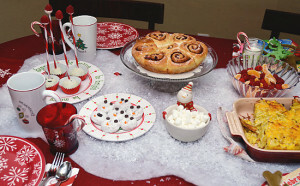 He even did all the dishes for Percy in the North Pole Bakery shoppe and promised to do the same for the next two days. That’s all for today!! We’ll see you next time……… HO! HO! HO! HO! HO! Well, well, well!!! there’s only 2 weeks left till Christmas boys and girls!! That means only 13 more nights till Santa and Harvey and the toys we’ll all leave! Delivering Joy on Christmas Eve… Zooming and circling the globe we will go, for a very Merry Christmas! HO! HO! HO! HO! Oh, yes indeedy do – just 14 more days and 13 more nights…. 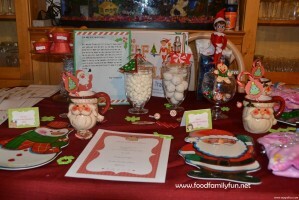 we are getting so excited, but still VERY BUSY here at the North Pole. Building, wrapping and packing toys and of course answering emails and letters from the children all over the big wide world. Which brings me to an often asked question… “Santa, how do you get into all the houses at Christmas time?’ Well, the answer is simple. Its because all the good boys and girls of the world are excellent brushers of their teeth! HO! HO! 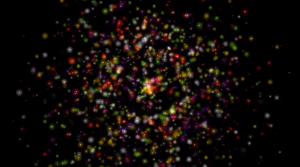 I know that may sound peculiar, but let me explain. You see good boys and girls keep their teeth clean by brushing twice each and every day. And eventually when they lose their teeth and put them under their pillow for the Tooth Fairy, she brings them to me here at the North Pole. You see nice clean teeth from all the GOOD boys and girls around the world are the main ingredient of Magic Dust. Then we add a little Christmas Spirit to the teeth and grind them up into a fine, fine MAGIC DUST! When I arrive at your house I can sprinkle the dust over my head and ZIP-BAM-ZONK!! 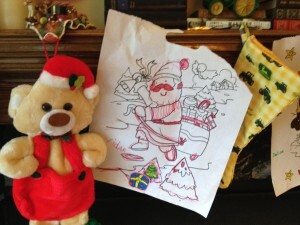 I instantly shrink down to a very, very small Santa…. then I can go down your chimney or find my way in thru a small crack in the window or door and then once inside I suddenly grow back into my normal size and deliver all your toys! 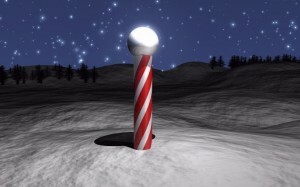 Then with another sprinkle, I shrink back down again and make my way back to the sleigh on the roof or out on the lawn! Then in a FLASH, I’m gone again to the next house and it all starts over again! So you see boys and girls, it is very important that you all brush your teeth and do good deeds to make sure the Tooth Fairy can keep delivering me the teeth of all the good boys and girls. I sure can go thru a lot of Magic Dust on a Christmas Eve!! HO! HO! HO! HO! HO! Remember, only 13 more nights till Christmas morning!!! See you next time…. Merry Christmas!!!! Its been a loooong day today boys and girls. We got up at 5am, fed the Reindeer, cleaned out the barn, restocked the supplies in the workshop, wrapping department and Percy’s bakery, then updated our Garmin GPS and had a Christmas Eve Route meeting with Harvey and the Reindeer team….. All before 8am!!! Well, after a brisk morning like that we were all pretty hungry, so Percy whipped up a big batch of raisin cinnamon waffles with blueberry syrup, whipped cream with chocolate sprinkles on top. And of course a big mug of hot apple cider!! After a short nap, it was off to the computer to check on the overnight ‘Naughty & Nice’ updates and a meeting with all the ‘Elves on the Shelf’ – there are a lot of them now, which is good! But remember boys & girls …. no touchy!! HO! HO! HO! Next, I gathered all the Elves around the big fireplace for StoryTime …. 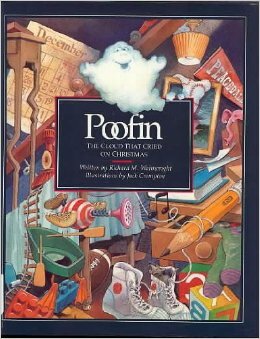 today it was ‘Poofin, the Cloud That Cried on Christmas’. Its a story about a small white, fluffy cloud sent to Earth just before Christmas to learn why clouds are important to people. Here’s the book cover. After StoryTime it was back to work for the Elves in the Toyshoppe and Harvey and I were busy testing and inspecting all those wonderful toys that you boys and girls are asking for. Boy! are they fun too!! 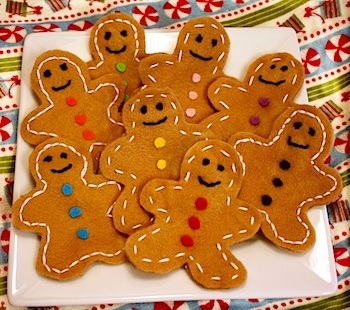 Soon, we heard the ‘Treat of the Day’ alarm and hurried to Percy’s magic oven in the North Pole Bakery to enjoy some fresh baked pumpkin tarts and gingerbread men cookies with a nice cold glass of milk!! Mmmmmm, Percy sure can bake! Its what keeps us going throughout the long day here at the North Pole. Now that we’ve had our treat and I’ve updated you all, its back to work! We still have a lot of toys to build and wrap for the big trip! Till next time – Merry Christmas to All!!! WOW! Henry Wahoowa our mail train conductor/engineer has been very busy delivering mail from all over the world! We are getting mail from Albania to Zimbabwe and all points in-between. Some of you have been asking for stuffed animals and REAL animals. We are getting requests for puppies, kittens, monkeys, hamsters, turtles, frogs, birds, horses, pigs, snakes, fish, even BEARS!! HO! HO! Well, I’m not sure how some of these critters would handle the trip from the North Pole but nothing surprises ‘ol Santa after all these years of bringing presents to you boys and girls. 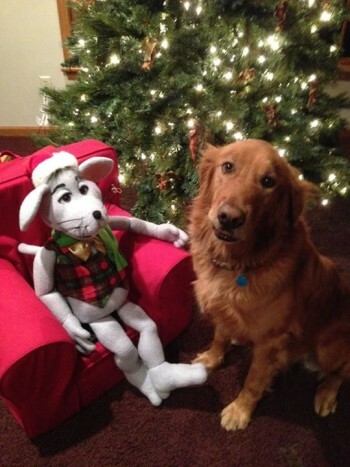 Remember, Santa has to make sure you are old enough and responsible enough to take care of pets like these. Some places where you all live won’t allow such animals to be had as pets. For instance a pet horse is pretty tough to handle if you live in an apartment in New York City!! HO! HO! HO!…… So Santa may or may not bring you everything on your list but that doesn’t mean you weren’t good. Its just that we all need to be careful in what we wish for and understand that mom, dad and Santa always know best. Some of your letters are asking to have your presents given to others who may not be as fortunate as you have been, and that warms Santa’s heart! Its so nice to see how thoughtful and caring you boys and girls are. Keep your letters coming! We will answer everyone that we get. 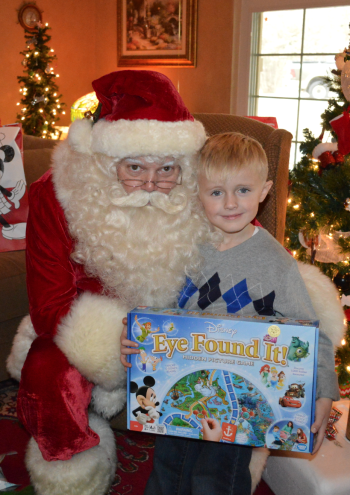 Be good and we’ll see you soon from Santa’s Toyshoppe here at the North Pole!! Merry Christmas…. only 16 more days till Christmas!!! !